Cryogenic Liquid Flow - Technifab Products, Inc.
For the most part, civil and mechanical engineers deal with fluid flow that conforms to the rules professed by Bernoulli regarding steady flow of a continuous stream of fluid. The fluid normally is either all vapor or all liquid. An engineer with cryogenic experience evaluates fluid flow in a cryogenic piping system very differently. Liquid fluids such as oil or water passing through a pipe or channel normally remain liquid throughout their entire journey. With normal liquids the pressure and temperature do not vary enough to change the fluid state. The cryogenic engineer, on the other hand, must constantly deal with a fluid stream that is both vapor and liquid with constantly changing proportions of each. They must deal with a fluid that is saturated and is therefore constantly on the verge of boiling. A slight change in pressure or heat influx will cause the liquid to boil until it reaches its new saturated condition within the slightly different environment. For example, liquid nitrogen stored within a bulk tank at 45 psig will boil until its saturated pressure reaches 45 psig. It then becomes stable within the tank. As it enters a piping system where frictional losses reduce the pressure (pressure drop) as it travels along, it becomes unstable and boils again. A typical problem for a cryogenic engineer is the sizing of a piping system for a needed flow rate of a cryogen. The cryogenic engineer must take into account the two-phase condition of the fluid in the piping system because two-phase flow dramatically affects mass flow rate. Any point of flow restriction such as a fitting, orifice, elevation change, or rough bore pipe will cause pressure drop. Any heat influx into the cryogen through the pipe will also cause two-phase flow since the higher temperature cryogen will boil at a constant pressure condition. Two-phase flow is unavoidable in a cryogenic piping system. It can an only be minimized. Two-phase fluid substantially reduces cryogenic system flow. Flow reduction can be estimated mathematically once total system pressure drop and heat leakage is known. A two-phase flow condition has a lower density than a pure liquid, resulting in a lower delivered mass flow rate. A rather homogeneous mixture of vapor bubbles and liquid. This condition can exist without a dramatic reduction in mass flow, although some equipment may not respond favorably to a vapor/liquid mixture. 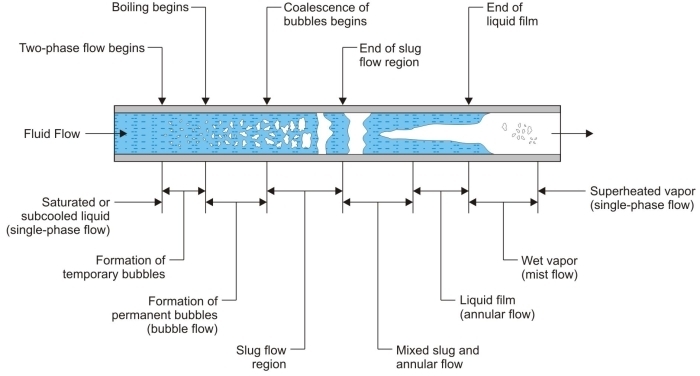 “Slug” flow, consisting of alternating sections of pure vapor and pure liquid. This condition results not only in a major mass flow rate reduction; it also can damage piping and equipment due to dynamic loading and vibration. Annular flow where the liquid moves along an annular region adjacent the pipe wall and the vapor flows through the center of the pipe. The vapor moves at much higher velocity through the center of the pipe, while the liquid moves at a slower velocity along the walls. This condition results in very low mass flow rate, rendering a piping system virtually ineffective. Technifab’s experience has been that any cryogenic piping system with a pressure drop greater than 10 psig (.7 bar) from the bulk tank to the end use point will not achieve flow rates predicted by standard hydraulic flow rate calculations. These conditions require a more thorough analysis of the two-phase flow and must account for the pressure drop and heat leak to prevent surprises in reduced flow when the piping system becomes operational. There are several ways that are used to reduce two-phase flow. They fall into two major categories, improving the system performance and venting or separating the vapor from the liquid.